The KDM110 Keep-nut Drilling Machine from Chemical Concepts™, is a lightweight, precision tool for drilling panels and countertops. This machine will enable any operator to repeatedly and efficiently drill holes with the correct dimensions for use with the Keep-nut anchoring system*. Using an array of compatible bits, the machine can prepare holes in a variety of hard surfaces including granite, marble engineered stone, UHPC, porcelain, Dekton®, glass, and composites. The vacuum foot allows secure attachment to rough surfaces including unpolished granite and textured ceramics. This water-cooled, pneumatic machine requires only a single airline and a water feed to operate. Use with thin-wall core bits to drill faucet holes in record time without a CNC. *Keep-Nut® is a press-in threaded insert that mechanically anchors to provide permanent threads in panels or countertops. The Keep-Nut insert is specifically developed to fasten ventilated façades, wall-coverings, décor, furniture, under-mount sinks, as well as a variety of other applications. Chemical Concepts is a company that has been in the countertop fabrication and kitchen remodeling business for over 50 years. This year we are featuring several new products including our new Stonetac Activator, 6600 Rodmaster Quick-set Rodding Adhesive, 650UC Ultra Clear Epoxy, and the Counterplate Plus 12" bracket. The Rodmaster 6600 Quick-set rodding compound is a toughened structural acrylic adhesive which sets up in 5-10 minutes and offers 5x the strength compared to polyester adhesives. This convenient cartridge based product is much faster to apply than traditional epoxies, saving time and labor, while providing superior protection for delicate surfaces. View our show specials by clicking this link! For revolutionary drilling capabilities in natural or engineered stone, porcelain, glass, UHPC, Dekton®, and composites, look no further than the KEEP-NUT™ Drilling Machine, new from Chemical Concepts. The KEEP-NUT™ Drilling Machine is a lightweight, portable precision tool perfect for repeatedly and efficiently drilling holes with exact dimensions for the KEEP-NUT™ anchoring system. Chemical Concepts’ new KEEP-NUT™ system is a press-in threaded insert that mechanically anchors to provide permanent threads in panels or countertops fabricated from marble, granite, composites, carbon, Corian®, HPL, glass, and other solid surface materials. Manufactured in stainless steel, KEEP-NUT™ consists of a threaded bush, a set of toothed spring washers (crowns), and a plastic ring holding the parts together. It is designed specifically to fasten ventilated façades, wall-coverings, décor, furniture, and undermount sinks, as well as a variety of other applications. KEEP-NUT™ is available in a variety of lengths to fit many different panel thicknesses and can be installed quickly; simply drill the material to the proper hole diameter and press in the insert. KEEP-NUT™ requires no adhesives or additional fasteners; the only preparation needed is a cylindrical hole drilled by a CNC or a grinder/polisher. Then, apply pressure to the fastener. Assembly is quick, easy, and permanent! For a live demonstration of the KEEP-NUT™ Drilling Machine, please visit the SFA CAGE (time to be determined) Booth #3096 for additional information. Come see all the other competitive products we have to offer you! For more information, please contact Chemical Concepts, Inc. at 1-800-220-1966 or sales@chemical-concepts.com. The KDM110 KEEP-NUT™ Drilling Machine from Chemical Concepts™, is a lightweight, precision tool for drilling panels and countertops. 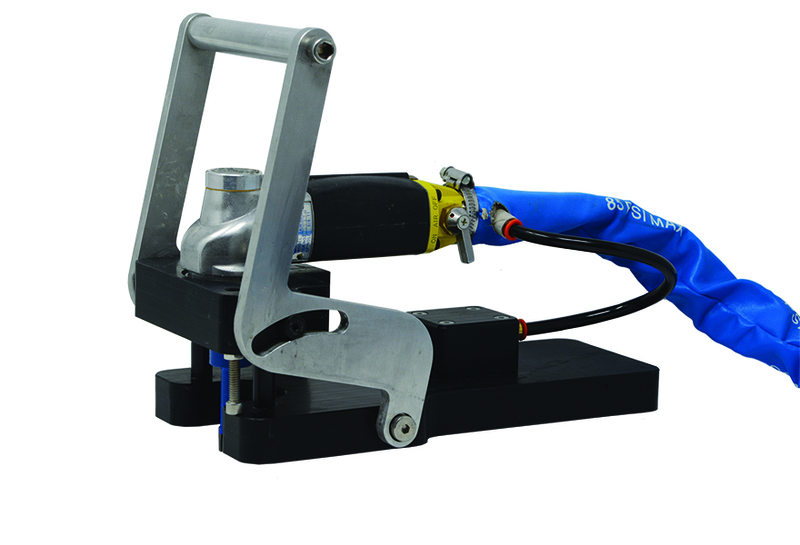 This machine will enable any operator to repeatedly and efficiently drill holes with the correct dimensions for use with the KEEP-NUT™ anchoring system*. Using an array of compatible bits, the machine can prepare holes in a variety of hard surfaces including granite, marble engineered stone, UHPC, porcelain, Dekton®, glass, and composites. The vacuum foot allows secure attachment to rough surfaces including unpolished granite and textured ceramics. This water-cooled, pneumatic machine requires only a single airline and a water feed to operate. Use with thin-wall core bits to drill faucet holes in record time without a CNC. *KEEP-NUT™ is a press-in threaded insert that mechanically anchors to provide permanent threads in panels or countertops. The KEEP-NUT™ insert is specifically developed to fasten ventilated façades, wall-coverings, décor, furniture, under-mount sinks, as well as a variety of other applications.